A long time ago, someone told me "Every day, you see a cow." I wanted to deny it, but in fact, I've come to believe it's true. You see them on commercials, in pastures, in magazine ads, in kids' drawings, in online stories and ads, on other people's blogs, on kitchen towels, in art stores, in toy stores, in museums, on milk cartons or containers of sour cream, ice cream, cottage cheese, or even glue--they are FREAKING EVERYWHERE. And that's okay with me, because unlike Gary, I feel great affection for cows. I'll admit that at times I've been edgy when walking around a group of them, because they stare at me with those bovine expressions of theirs and I start to wonder, What are you up to, pretending to so placidly chew your cud? Are you planning a revolt against your oppressors and murderers? I've shown you the herd of cows who graze here at The Compound. 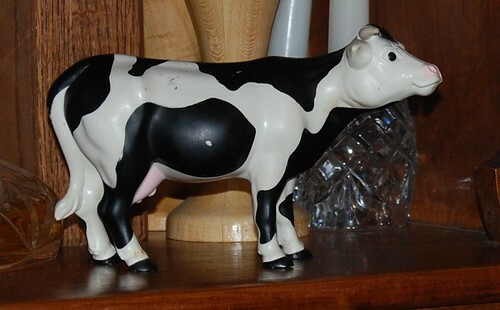 Recently in a four-dollar STEAL of some items I won in an eBay auction, my shipment included a random plastic cow. Ironically, the same day I received her, Lindsey and I took my Nikon out shooting, and our wandering led us to a junk store, where I found some steak plates that were also a steal, so I bought them. Seven hundred and thirty-five years ago, when I was in college and married to a different man, my roommate Debbie, who's a tolerant vegetarian, bought us two steak plates. I still have them, but since there were only two, Tom and I basically stopped using them when Timothy moved onto The Compound. It would make me twitch worse than Bossy's tail if two people used steak plates and the other used a regular plate. The steak plates Lindsey and I found were slightly smaller, but there were four of them in barely used condition, which meant I could serve SIX people a steak dinner on steak plates and make my table, as I told Lindsey, "Just like the Western Sizzlin'!" 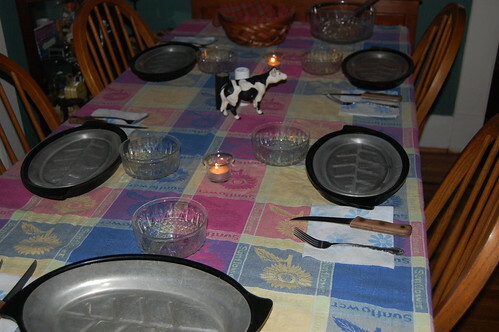 My lovely table set for five. Sadly, I was drying my hair when The Brides arrived, so I missed Rhonda's exclamation of dismay, but it was recounted to me later. HA. Last Saturday, after the gym, I joined Rhonda, Lindsey, and Tom for a spontaneous lunch date at the fabulous Baba Yega (where I did not eat beef). As our meal was winding down, Lindsey randomly said, "Let's go to Galveston." Without hesitation, I said, "Yes!" because I've been wanting to go to Galveston FORever, and haven't been since last year's Hurricane Ike devastated it. But that's a conversation for another post I'll probably do on the anniversary of Hurricane Ike. I came home from Baba Yega and packed my camera, tripod, sunglasses, and instant hand sanitizer--What? You don't take hand sanitizer with you everywhere?--plus I slipped a few other items into my bag because if there's anything I believe it's my lot in life to do, it's beat a dead cow on behalf of The Rhonda. And that is how I got the shot that provided the title of this post and should, in fact, be the title of a book and a blog and a TV show and a poem and a song because WHAT THE HELL DOES IT MEAN, ANYWAY? And because I'm always thinking of Mark G. Harris, J.K. Cowling stepped away from the camera and allowed Rita and Tamala to pose for this shot to send to Figaro. L to the M, baby, L to the M.